When we sit down at our Thanksgiving meal this month, we’ll be recreating a celebration that is as old as our country: sharing food with loved ones while thanking the God Who has provided the abundance. While we understand that the First Thanksgiving was celebrated here by the Mayflower survivors along with the Indians that had helped them, the first official proclamation that was decreed to celebrate such a holiday was in 1777. It was a recommendation to the thirteen states by the Continental Congress to set aside December 18th that year as a “solemn thanksgiving” to celebrate the first major victory for the Continental troops in the American Revolution: the Battle of Saratoga. The Battle of Saratoga has significant interest for my own family since one of my ancestors was a soldier there. But he was not on the American side—he was a British Redcoat. After surrendering to the Americans, he escaped the line of prisoners and somehow made his way to Massachusetts and into the life and heart of my fourth great-grandmother. *SIGH* L’amour! 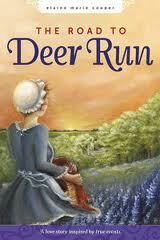 This family story was the inspiration for my Deer Run Saga that begins in 1777 with The Road to Deer Run. There is an elaborate Thanksgiving meal scene in this novel as well as in the sequel, The Promise of Deer Run. But Thanksgiving was begun as a way to give thanks to God for His provision. It usually began with attending church services in the morning, followed by an elaborate feast in the afternoon. The food for this meal was prepared for weeks in advance. Since the individual state governors chose their own date to celebrate the holiday, it was theoretically possible for some family members—if they lived in close proximity—to celebrate multiple Thanksgiving meals with family and friends across state borders. The dates chosen could be anywhere from October to December, according to Dennis Picard, Director of the Storrowton Village Museum in West Springfield, Massachusetts. Chicken was most commonly served, said Picard, as it was readily available in the barnyard. And the oldest woman in the home had the honor of slicing the fowl for dinner. Pies were made well in advance of the holiday and stored and became frozen in dresser drawers in unheated rooms. “I like the idea of pulling out a dresser drawer for, say, a clean pair of socks, and finding mince pies,” said Picard, tongue in cheek. Elaine Marie Cooper grew up in Massachusetts but now lives in the Midwest with her husband, her three dogs and one huge cat. She has two married sons and triplet grandchildren who are now one years old. The Promise of Deer Run is dedicated to the triplets and to veterans who suffer from Post Traumatic Stress Disorder.Elaine has been a magazine freelance writer for many years, and is a regular contributor to a blog on the Midwest called The Barn Door (www.thebarndoor.net) and a blog on Christian living called Reflections In Hindsight. She is the author of The Road to Deer Run and the sequel, The Promise of Deer Run. Prior to becoming an author, Elaine worked as a registered nurse. This article provided by Elaine Marie Cooper and KCWC. Thanksgiving was a month ago here, but the book still sounds good. BTW: I just wanted to say, I know I’ve been away from the blog world for a bit, due to general busy-ness, but I really enjoy the new look you’ve given this place. Have I mentioned that Green is my favourite colour? I might like to read that book, Quilly. We have a family letter written by our Fletcher ancestors of that first Thanksgiving. It was very informative and I’d like to read more. Moses Fletcher, a cousin of that era, came across on the Mayflower. … impolite by thaning not thanking you. Jim — I don’t know where your free book went, either. I mailed it once and it came back. I put it in a new envelope to mail again and lost it. At first I figured it would turn up in a few days, and then I forgot about it until just now, reading your comment. We’ve had a crazy busy summer. I have had company come and go and I have done much traveling myself. My office is a fright show and I plan to clean it this week. I will likely find your book — in it’s addressed envelope ready for the post office — somewhere at the bottom. If I do, I’ll mail it. If I don’t, I have no idea where it has found itself. Thank you, Quilly. 🙂 I am not hurting for books but it was a nice one to have. Not hurting because we have a nice country library and also a very nice church library.